People suffering from severe symptoms of Myasthenia Gravis may need to discontinue their jobs and undergo a series of therapies to improve their weakened muscles. In this difficult situation that you are suffering from severe Myasthenia Gravis, you may be entitled to receive long-term disability insurance that will allow you to sustain your treatments and support your living expenses. 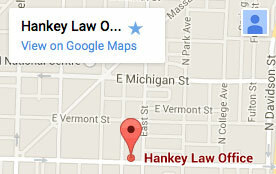 Find out how the Indiana lawyers of the Hankey Law Office may possibly help you get your benefits today by calling 800-520-3633.